Every three seconds, someone in the UK has an asthma attack - new figures show. According to a survey of 10,000 asthma sufferers by charity Asthma UK, people are having more attacks every year than previously thought - an average of two. And with 5.4 million people in the UK currently receiving treatment for the condition, experts calculate this means over 10 million attacks are suffered every year. Previous studies had suggested the average was around one attack every 10 seconds. Asthma affects the airways, narrowing them and making it harder to breathe. An attack can be life-threatening, with three people on average dying every day from an attack. Triggers can include cold air, coughs and colds, and grass pollen. 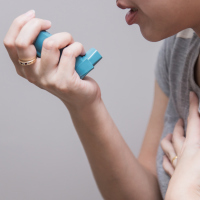 Dr Andy Whittamore, clinical lead at Asthma UK, said: "It is shocking to think that every three seconds in the UK someone could be having an asthma attack, a terrifying experience than can cause distress and in some cases prove fatal. "Asthma attacks do not come out of the blue and if people recognise the tell-tale signs that an attack is about to strike, they can get the help that could save their life." The charity warns that if people need to use their reliever inhaler (usually a blue colour) three or more times a week, or are are waking up at night because of their asthma, they should contact their GP. They should also seek help if their symptoms, such as wheezing or a cough, are getting worse or are interfering with their usual activities. Those with a preventer inhaler (usually brown) should take it daily to help build up protection against asthma attacks. Kelly May, 31, a hairdresser from London, has had hundreds of asthma attacks since she was a year old. She said: "Having an asthma attack can feel like being a fish out of water and it's terrifying. No matter what I do, I can't catch my breath. I try not to panic but in the back of my mind I know I need to get to A&E or it could be fatal. "People think that asthma isn't serious, but I've had asthma attacks at work and it's terrifying for those around me. The aftermath of an asthma attack can also be exhausting and horrible - it can take me weeks until I feel normal again." NHS data shows there were more than 77,000 hospital admissions for the condition last year. If you're living with asthma and are looking for travel cover that meets your needs, check out our dedicated asthma travel insurance and give yourself peace of mind.